> Kids>Wooden shiba family "Pole Pole"
Wooden shiba family "Pole Pole"
Decorative wooden shiba family. "Pole pole means slowly, little by little, in Swahili. T-Lab is a Japanese maker committed to communicate the warmth of wood and handworking whilst preserving the forests. 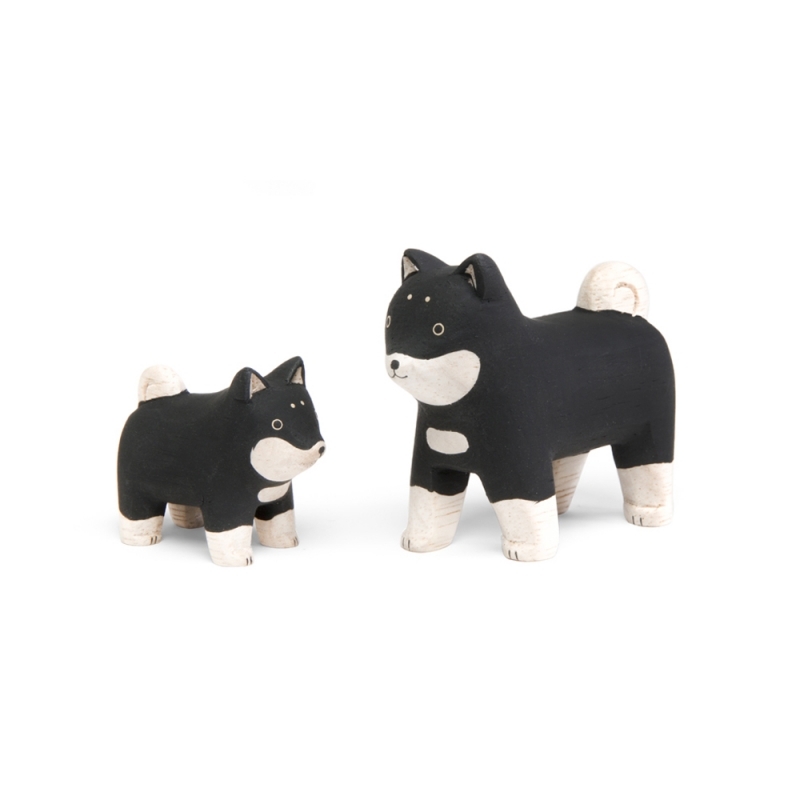 Decorative wooden shiba family. "Pole pole" means slowly, little by little, in Swahili. T-Lab is a Japanese maker committed to communicate the warmth of wood and handworking whilst preserving the forests. This wood can be well finished, smooth and soft, and the final product is very lightweight. Once it is finely sanded, it is hand painted, each piece is therefore somewhat different and absolutely unique ! Only high-skilled craftsmen can achieve this task to make almost identical results of the same animal. The original design, round and soft, is really lovable. Will you be able to choose among those animals ? CAUTION : These animals are decorative objects. It is not suitable for children who could put it in their mouth. The mat black painting is very sensitive to scratches. Do not clean with water, the painting could dissolve. Preserve from excessive heat to prevent from fading and wood cracking. Being untreated, the wood is naturally sensitive to humidity. Placed in a too damp room, mould could grow. Parfait, ils sont trop mignons! L'emballage est de qualité et avec soin. Il s'offre directement sans souci. "Pole Pole" means slowly, little by little, in Swahili. The Japanese maker T-Lab is committed to share the warmth of wood and manual labour. The original design, curved and soft makes them endearing. Cutting, carving, sanding finely and thoroughly hand painting, each piece is somewhat different and absolutely unique ! Only high skilled craftsmen can obtain almost identical results for each animal. T-Lab preserves the Albizia Falcata forests that naturally grow fast, by transplanting the trees used for their production. There is no chemical or pollutant treatment of the wood nor for the paint.